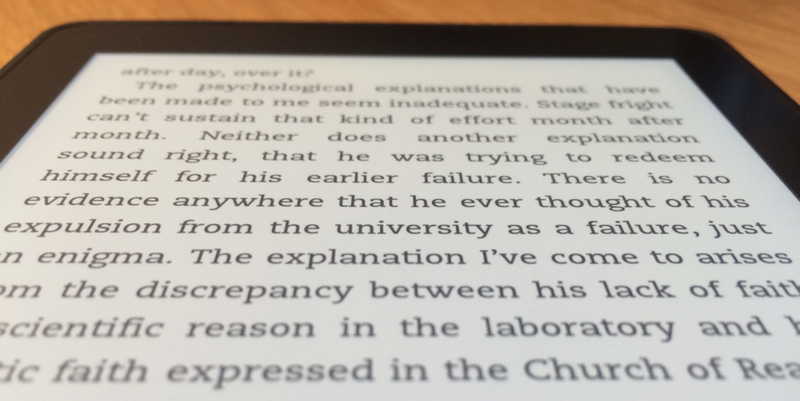 I received my Kindle Voyage earlier this week, and thought I’d share my first thoughts on Amazon’s latest eReader. At first glance the Kindle Voyage looks like a slightly more compact Paperwhite, but there is much more to the latest flagship eReader from Amazon. 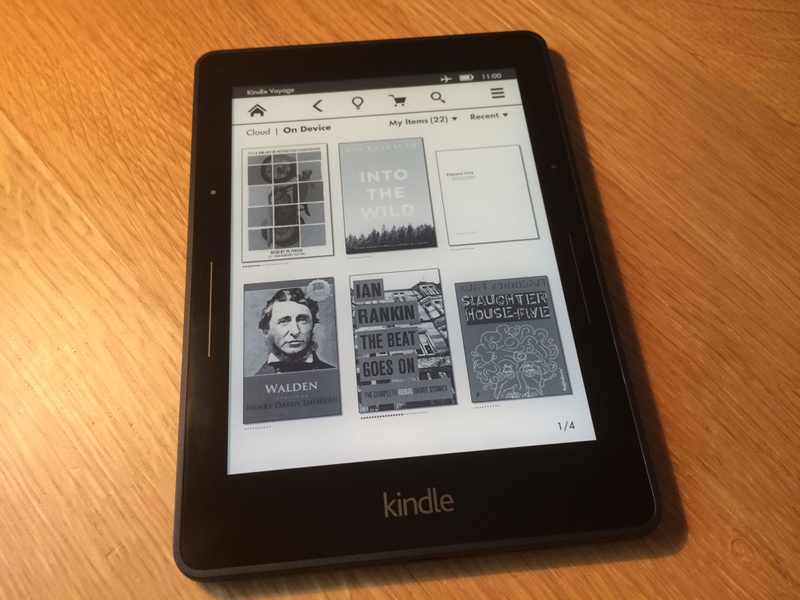 The screen of the Kindle Voyage sits flush with the body, in fact the screen forms the front of the Voyage. The screen is no longer recessed as with the Paperwhite as the Voyage uses a capacitative touchscreen rather than Infra-Red, this makes for a much more attractive and responsive device. The screen is glass but has been specially etched to prevent reflections and, Amazon say, to replicate the texture of paper; I’ve seen no reflections so far, and whilst I might not say the texture is that of paper it is very nice – nicer than that of the Paperwhite. Of course the main headline for the screen is it’s significantly higher resolution, which at 300ppi is retina territory. It’s a staggeringly good screen, with wonderful crisp letters, great contrast and not a hint of a pixel no matter how hard your look, and the front-lighting is now completely uniform across the screen. The Kindle Voyage now has an ambient light sensor and can automatically adjust it’s lighting to match the lighting where you are reading. There is also a nightlight setting making the Voyage dim more slowly to allow your eyes time to adjust. Reading in bed last night it was like holding a piece or magically glowing paper — quite wonderful. PagePress is a custom-designed force sensor made of carbon and silver, which reacts to a subtle increase of pressure, triggers a page-turn and provides a haptic response only your thumb can perceive. Because PagePress has no moving parts, the haptics provide you with the most minimal indication that you have pressed the button, to reduce distraction from reading. At first I tapped them, as you would regular touch screen devices, which doesn’t work. They require a slight pressure or squeeze with your thumb or finger and responded perfectly once I’d adjusted my technique. To paraphrase Steve Jobs “I was squeezing them wrong”. The level of pressure and feedback can be adjusted within settings allowing you to fine tune to your preference or switch them off completely. PagePress works perfectly for me, I was worried that the combination of my larger hands and the Voyage’s slimmer bezels might make them tricky to use but I’ve had no issues at all. The body of the Kindle Voyage is made from magnesium and coated in a non-slip rubber coating. This make it light and strong and a complete and utter fingerprint magnet, luckily I seldom look at the back. The Kindle Voyage is by far the best eReader I’ve owned and used; combining a lightweight, easy to hold body with an incredible high resolution screen. Highly recommended.